This ornamental grass is native to the prairie so this versatile grass is ideal for planting in a sunny gravel garden as well as in the traditional perennial border. Stipa tenuissima Pony Tails (also known as Nassela tenuissima. 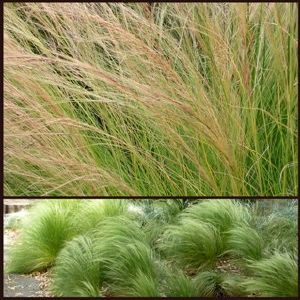 Mexican feather grass) has very fine wispy, pale to yellowy-green leaves topped with feathery plumes of silver grey flowers, the whole plant maturing to a blond colour which persists well into the winter months. Stipa tenuissima has a graceful arching shape making it a wonderful specimen for animating and introducing movement into the garden. Stipa tenuissima can also be grown in light shade. Pony Tails enjoys full sun and is drought tolerant. Easily grown in average, medium to dry soils, in full sun or light shade. Does well in most well drained soils. Pruning \ Aftercare : Cut plants back to the ground before new growth begins in the spring.